Trees have paper-like bark. Snapped twigs have wintergreen aroma. Bark and twig tea used for lung problems, sore muscles, joint pain, skin fungus, cracked heels, bladder and urinary issues, stomach aches, laxative, diuretic, colds, fever, rheumatism, diarrhea, tumors, cancer, anti-viral, anti-inflammatory, skin cancer. 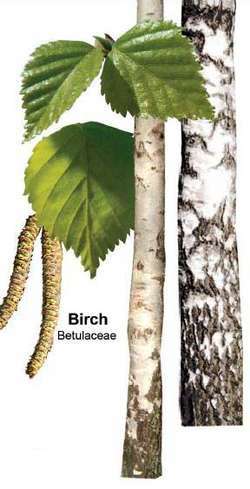 Birch tea has been historically used in enemas. Worm-like flowers (catkins) also edible.